Lighteck's Wireless Mini USB Adapter is a perfect solution to upgrading your computer's wireless networking speed. 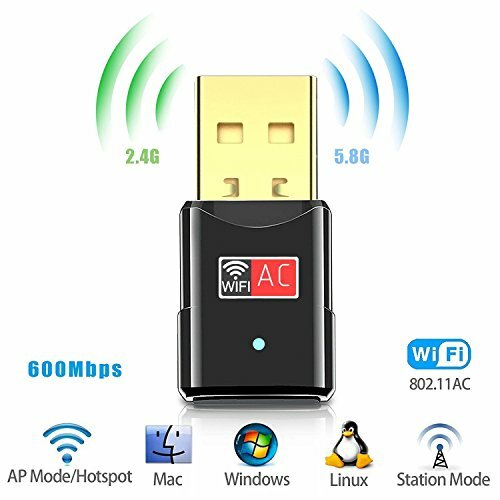 Enjoy more convenience with your wifi USB adapter, with AC600 wireless AC adapter, you can shift between 2.4GHz and 5GHz wifi bands to avoid interference and have optimal wifi internet connection for your PC, laptop or Mac. Plug in the wifi adapter to connect to your wifi with the client mode or create a hotspot with the AP mode. If your computer failed to identify it, please select the appropriate driver from the CD and install it. 1:Mini size design.space saving and easy to carry. 2:Heat dissipation holes,no fever and performs. 3:Maximum speed up to 5GHz 433Mbps or 2.4GHz 150Mbps. 4:Works with Any WiFi Routers. 5:Easy to use, once you've installed the CD and run the software, you can simply insert the adapter to get connected. HIGH SPEED DUAL BAND WIFI: This usb wifi adapter's maximum speed up to 5GHz 433Mbps or 2.4GHz 150Mbps. Ideal for gaming online and seamless HD video streaming. Ultra-fast AC600 wireless adapter speed with 802.11ac. If you have any questions about this product by Lighteck, contact us by completing and submitting the form below. If you are looking for a specif part number, please include it with your message.